When you are looking for deodorant without palm oil, choose the ones with as few ingredients as possible. In deodorant, palm oil ingredients are hidden under many names. They are prevalent in spray, wipe, and stick deodorants as well as antiperspirants. It is possible to find deodorant free from palm oil derivatives. All of these companies show their ingredients easily and transparently on their websites. They have nothing to hide! All of Ethique’s products, including deodorants, are palm oil free. This is one of the few companies who advertises each of their products as “palm oil free” on their website. They are cruelty-free, sustainable and vegan as well. They also include minimal packaging. Both of these deodorants are for all skin types. They are made with bamboo, aloe vera, and yeast as well as sage and horsetail extract. They are free from aluminum and baking soda. We bought and love them both. Their Lavender & Vanilla was part of their Body Sampler box. 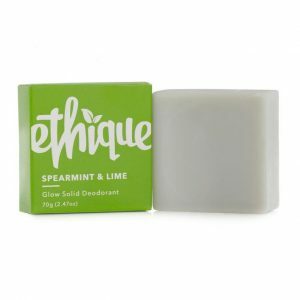 After using it up, we ordered Ethique’s Spearmint & Lime in the full size. Neither have strong scents which we like. They go on easily. The full size bars are 2.47 oz. We also like they have an Ingredients section on their website which explains the source of each of their ingredients. Again, they are all palm oil free. 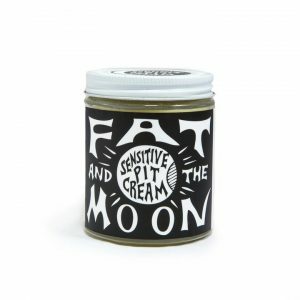 Fat and the Moon’s vast array of products are all palm oil free. Most of the ingredients in these deodorants are organic. Deodorant Cream comes in 2 oz and 6 oz while their Lil’ Deodorant Cream is available in a .5 oz tin. These creams are made with coconut oil and baking soda. The baking soda is aluminum free. 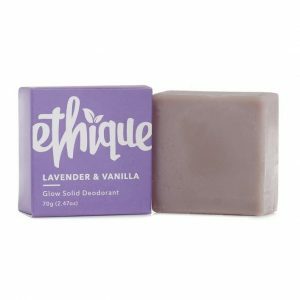 Additional ingredients include arrowroot starch, beeswax, essential oils of black pepper, clary sage, bergamot, tea tree and grapefruit. Their Sensitive Pit Creams are free from baking soda. These are made with coconut oil, arrowroot starch, magnesium hydroxide (milk of magnesia), beeswax, essential oils of basil, and vetiver. 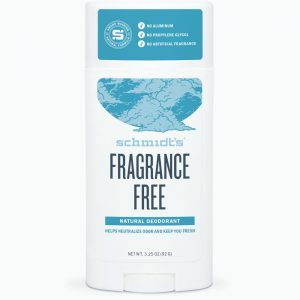 Schmidt’s deodorants are certified vegan and cruelty free. Also, they are free from aluminum, parabens, phthalates, propylene glycol, and artificial fragrances. Their regular deodorants contain Sodium Bicarbonate (baking soda). Their Sensitive Skin deodorants do not. If you were to see these ingredients — without their source listed — in other deodorants, they will often be sourced from palm oil. Our kids use the unscented, Fragrance Free deodorant. It’s easy to apply and gets the job done. Their sticks are 3.25 ounces. This is a cream deodorant. We found this at our natural grocer. You can look online for locations in your area or purchase it online from their site. All of Booda Organics products are palm oil free. 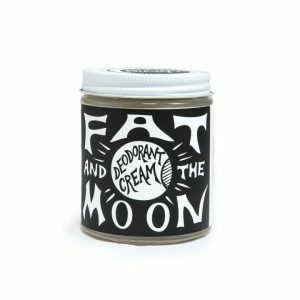 This handmade cream deodorant is Non-GMO verified, Cruelty-Free, and Vegan. It’s also soy, bee, wax, and gluten free. It’s free from propylene glycol, aluminum, alcohol, phthalates and parabens, sulfates, chemicals and synthetics. 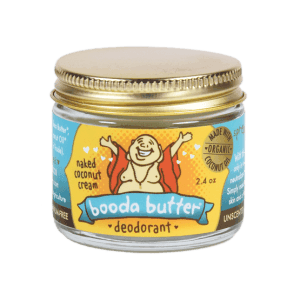 This deodorant contains Pure Baking Soda, Organic & Fair Trade Certified Shea Butter, Organic Tapioca Flour, Organic & Fair Trade Certified Virgin Coconut Oil, Organic & Fair Trade Certified Cocoa Butter. This cream deodorant is 2.4 ounces. A little goes a long way. They explain on their website you could also use this for bug bites and bee stings. This is roll on deodorant. We ordered it online for our kids. They prefer solid blocks and stick deodorants so while we tried it, we didn’t repurchase. An even better alternative is to make your own deodorant. You can make it palm oil free by using this recipe from EdiblePerspective.com. Once you get the ingredients, it’s easy to make DIY deodorant. Know that many of the name brand deodorants, even those advertising aluminum-free and propylene glycol free, contain palm oil. Like with bar soap, you will have a better chance finding a stick or bar type of deodorant without palm oil than finding it as a spray or wipe. Use this list to make it easy to find. Read labels. These are many common palm oil derivatives you will find in deodorants and antiperspirants. 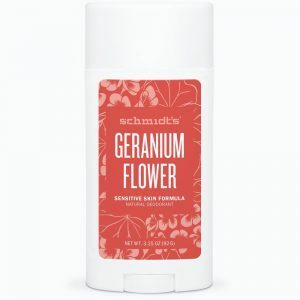 If you know of other palm oil free deodorants, please list them in the Comments. This list is meant to be a starting point as a reference and isn’t guaranteed. Please read labels as manufacturers change ingredients. Be sure to support companies who make palm oil free deodorant. See our list of palm oil free products.